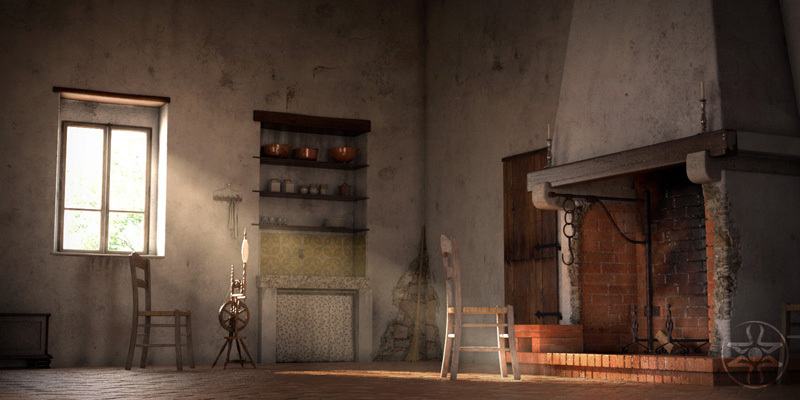 The image "Farnetella" was built as a test scene for 32 bit compositing worflow in Photoshop CS3. But the result was disappointing because of some render layers problems and all the limit [and frustrations] I found in Photoshop CS3 with 32 bits compositing [I hate that program, it's official...]. I promised myself new tests but with other compositing programs as Nuke or After Effects [I know this one is not properly a compositing program, but it's far better than Photoshop]. I will share new tests results. For this last result, I put aside Modo render passes and launched a final render with a separated volumetric pass. Then I composited everything in Photoshop with a series of correction layers to increase the "mood". Just a little bumpy and noisy, I know, but there is not additional time fot this test scene.